A history of activism by artists and workers of color: 1960-2015. This series of workshops explores the intersection of art and activism by artists and workers of color from 1960s to the present. By collaboratively mapping out the history of activism by people of color we can begin to consider their role in shaping our cultural institutions and the implications within the larger struggle against repression that affects us on a personal and collective level. ‘Timelines’ is a collaborative art-making workshop. After a brief introduction participants will add graphics, images, and text on to blank timelines. We will have some art supplies, but participants are free to bring their own art materials, images for collage, texts, graphics, and clippings related to artists and workers of color. We also have a printer for printing additional graphics or texts for the timeline. Each session will span two decades and when possible begin with an introduction by an invited guest artist, historian, or researcher. Registration is required. Please RSVP to classes@interferencearchive.org, and indicate which session(s) you would like to attend. 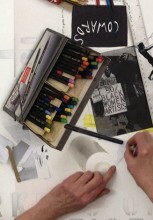 ‘Documents of Resistance’ a research based project focusing on the history of activism by artists and workers of color. The project was started by Antonio Serna in 2014 and grew out of his research on the alternative art histories of the 1960s/70s within Arts & Labor’s Alternative Economies Working Group.